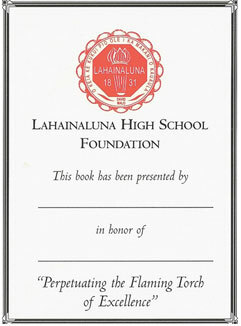 The Friends of The Lahainaluna High School Library Program is a unique Endowment Fund. For a one time donation of $500.00, a book, or other library related materials are purchased and placed in the Lahainaluna Library every year in perpetuity. This is a wonderful way to honor or memorialize those who have made a difference in our lives. The goal of 100 endowed books for the Friends of the Library Endowment Fund was reached several years ago, and there are now 154 permanently endowed books. To date, the Foundation has placed more than 1,250 books into the library collection, and there is no end in sight! Placed in the front of each book is a bookplate commemorating the donor and the person in whose honor the book is given. In a special place in the library are the records of the donors, honorees, and titles of books placed. 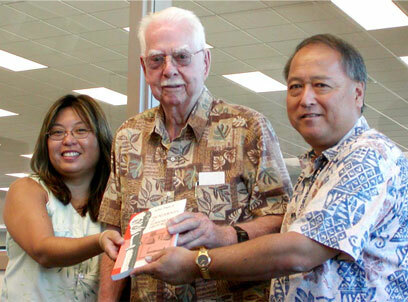 The Friends of the Lahainaluna Library began with one endowed book, a donation from Harlow Wright of Lahaina in December 2002. As of July 2006, there were a total of 68 endowed books, in 2016, a total of 154. Your donation today will continue to purchase books and library related material for our students to use for years to come. Presentation of the first endowed book by Harlow Wright to librarian Sharyl Seino and principal Mike Nakano.